When I first heard about author A.S. King, it was right before the release of her first book, The Dust of 100 Dogs. I thought it sounded pretty good, and I wasn't at all put off by reviews that claimed it was weird. Then I read it, and...it was really weird. Really, really, really weird. But it was weirdness I could dig. Fast forward a couple of years, and all of the sudden I'm hearing about Please Ignore Vera Dietz (my October Employee Pick of the Month!) the week before it came out. It took me a couple of weeks, but I finally got to it and it knocked my socks off. The writing, the subject, the relationships--it was absolutely brilliant. It's no wonder it was a Printz Award finalist. King's third book, Everybody Sees the Ants, was one that I wasn't crazy about at first. I didn't exactly get excited about the summary, or the male narrator. Weird is King's specialty, but this one seemed like it beyond any sort of weirdness I could handle. However, I had to give it a shot, I am immensely glad that I did. So now that the release of King's fourth book, Ask the Passengers, is so close upon us, I absolutely had to make it this month's prize for the Monthly Commenter Contest. I get happy/excited thoughts whenever I read the summary, though I've learned to just go with anything that King writes despite any initial hesitations. Click here to read all about it! How to win: Every time you post a significant comment that contributes to the conversation, I give you an entry into the contest! The more you comment, the more you entries you get! Only comments on posts from October 2012 are eligible, so keep coming back for more posts and more chances to comment. For all of the details, click here. 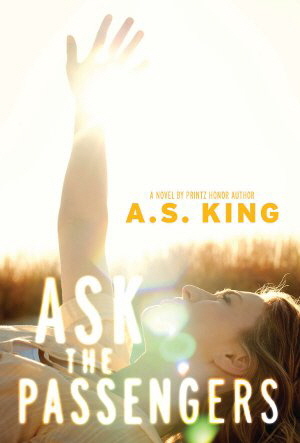 I keep hearing about how great A.S. King is...I really need to try one of her books. I think "Ask the Passengers" may be the one. I'm like you, I had a copy of "Everybody Sees the Ants" but I never opened it...it just sounded to outside my comfort zone, I guess. I loved her other books - especially Dust of 100 Dogs! One of my all time favorites. She writes great quirky characters. I would LOVE to read this one. I picked up "Please Ignore Vera Dietz" because of all the mixed revies I was seeing of it on YouTube and I wanted to figure out my own opinion of it. I thought it was quite good, but I have yet to pick up another of her books. I might give this one a try.